I am amazed at the high level of clinical knowledge Dentists have. There are so many clinical courses available to you like never before. I see you add your expertise to your website and social media. This sets you apart from the rest, as the dentist who has a particular, clinical expertise. But when you complete a course do you share the basics of your knowledge with your team? Do you make sure your team, who are answering the phones, know what to say and ask when patients are calling for the particular treatment you now offer. 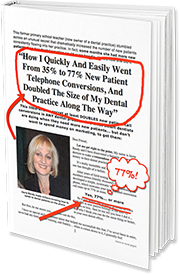 Your website and social media promote you as the go to dentist in the field of, let’s say, implants, your team need to know what to say and ask callers when they ring your office. If your team don’t know what to say, then you could be missing out on a lot of patients wanting and needing implants. If you haven’t thought about this. Now you are. Once you increase your level of expertise, you need to increase the level of expertise of your whole team. Meet with your team regularly and go over the type of questions callers will ask and how to handle types of calls. You want to make sure your team are well equipped to handle the calls and make the appointments. Don’t let all your education, training and expertise be in vain because the people who want what you can give them never actually make it to your dental chair. he next Master Class in Melbourne is “How to Turn Every Dental Phone Call Into A Valued and Kept Appointment” on Friday 31st August 2018.